Posted March 4th, 2018 by Mike Boyes & filed under Emerging Adulthood, Human Development, Motivation-Emotion, Social Cognition, Social Psychology, Stress Coping - Health, Stress: Coping Reducing, Student Success, The Self. Description: The transition from high school to college or university can be easy or challenging. Those of you contemplating your own upcoming transitions to post-secondary settings may be wondering how it will go for you. The best predictor of post-secondary educational success in secondary educational success, or on other words, if you got good marks in high school the odds are good you will get good marks in college or university. But…..hearing that your odds are good or not so good (if your GPA is just going to get you in the door at a college or university) are really just statements about your likely standing in a normative distribution of other transitioners. What would be more encouraging, or more motivating if you need to change things to succeed, would be some insight into the personal characteristics you might have or that you could work on that will contribute to success in college or university. There are two things that make this sort of information useful. First, there is a restricted range issue. Most people make it through high school but only those with suitably high GPA’s get to go to college or university. This means that by entering college or university you have left a lot of people behind (well, maybe better to say a lot of people made other career path decisions) and this means that you and your new college and university peers (all with good to great GPA’s) are going to re-sort yourselves into new distributions that will be determined by grades certainly but also by interests, choices, motivational drive, study skills, academic and personal commitment an engagement – many of which are not directly academic in nature. Figuring out how these other dimensions work and apply to you can be an important part of making a successful post-secondary transition. Second, your shift to post-secondary settings is associated with your shift into a stage of emerging adulthood which will last from around 18 to 29 years of age and while this life stage has a lot of thing going on in it one of its biggest features is that in involves your taking up personal responsibility not just for the signs and symptoms of adulthood but for how you are taking up and getting engaged in the processes involved in becoming a functional adult member of your communities. It is more up to you now than at any previous point in development. So, the article linked below talks about an array of non-academic factors that differentiate Thrivers (top 10% of academic performers in 1st year) from Divers (bottom 10% of academic performers in 1st year). The results are potentially quite useful. The article itself is a bit daunting, being 56 pages long but navigating it can help you develop research paper reading skills that will be of great assistance to you going forward. First, there is a LOT of detail in the paper regarding the data management strategies and statistical tests the researchers used in processing their data. These things are important in some contexts as they help us to evaluate the value of the data. However, if you just want to see what the researchers found that might be worth thinking about then you can set the technical sections aside for now. Read the introduction first (pages 1 through 4) then skip down into the results section (the part starting on the bottom of page 14) and read from there to the end of the article. Oh, and before you start, think about what you believe might be some of the important non-academic things that students can do to increase the likelihood that they will move through first year as Thrivers rather than Divers. This will help you to see more clearly if there are thin gs in the paper that you can take away and apply usefully to your own situation! 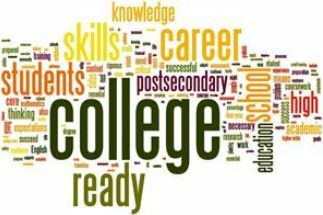 or patience, is the key predictor to an exceptionally successful transition to college.” Some good things to think about. How are Thrivers different from Divers in terms of their academic performances? How are Thrivers different from Divers in terms of their non-academic performances? Are there any insights in this study that you feel are worth “taking away” and applying to your own circumstances? What are they and how do you see yourself acting upon them?